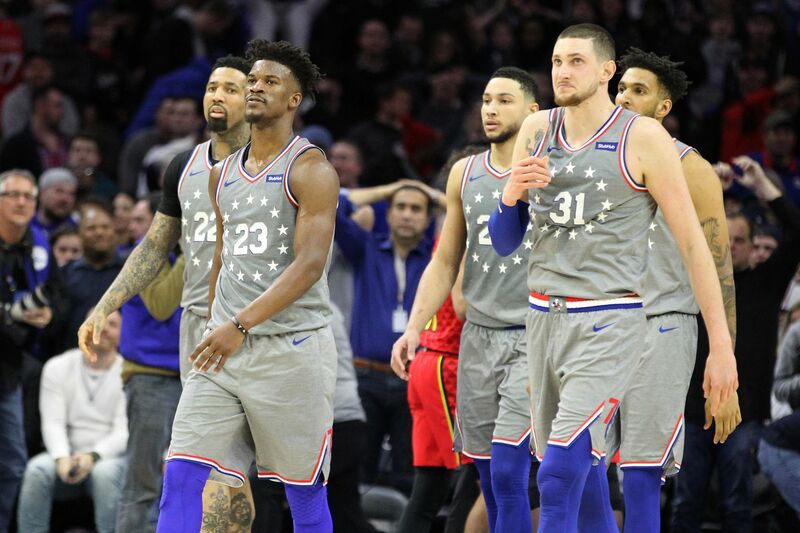 The Sixers, including Jimmy Butler, 2nd from left, walk off the court after their 123-121 loss to the Hawks on Jan. 11, 2019. Butler missed 2 free throws that would have tied the game. The 76ers lose a lot without Joel Embiid. And on Friday night, they lost to the lowly Atlanta Hawks without their All-Star center. Jimmy Butler missed a pair of foul shots with 2.4 seconds left and the Hawks escaped with a 123-121 victory at the Wells Fargo Center. Atlanta went up by two points after John Collins' 13-foot jumper with 9.5 seconds left. After calling a timeout, the Sixers ran an isolation play for Butler. The four-time All-Star swingman drove the the lane, and was fouled by former Sixer Justin Anderson with 2.4 seconds left. He went to the line, where he was a perfect 12-for-12 at that point. However, he missed the first foul shot. Then, Butler intentionally missed the second attempt. Ben Simmons kept the ball in play, but Wilson Chandler failed to convert a tip-in right before time expired. Ben Simmons, top, of the Sixers tries to tip Jimmy Butler’s missed free throw in against the Hawks on Jan. 11, 2019. The Hawks won 123-121 after Butler’s missed opportunity to tie the game. The loss dropped the Sixers to 27-16. It was their second straight setback to a struggling team. The Hawks (13-29) have the fourth-worst record in the Eastern Conference. On Wednesday, they lost to the Washington Wizards, an 18-25 squad. The team also dropped to 1-2 in games without Embiid. It defeated the Detroit Pistons, 117-111, when he missed a game for rest on Dec. 7. But they lost to the Portland Trail Blazers, 129-95, on Dec. 30 when he sat out with left knee soreness. Amir Johnson got the start at center in that matchup. However, he missed the game against the Hawks due to a migraine headache. This game, Embiid was out with a sore ankle. With Johnson out, Mike Muscala started against his former team. Meanwhile, Simmons was the Sixers' backup center in addition to his starting point guard role. Jimmy Butler, center, of the Sixers gets fouled by John Collins of the Hawks during the 2nd half on Jan. 11, 2019. Atlanta shot 55.6 percent overall from the field and made 12 of 25 three-pointers (48 percent). The Hawks also a 44-30 rebounding edge. He doesn’t think the Sixers are physical enough. Simmons said defensively they don’t take it personally enough when guys score on them. “It should be a pride thing,” he said. “When somebody scores you should be frustrated every time. I think that comes with age. We have a lot of young guys, but at the same time. We have to expect more from each other to get better and get to each other to get to that next level." Without Embiid, the Sixers might have a tough time advancing far in the postseason. Muscala is more of a stretch five than a dominant offensive and defensive presence like the 7-foot-2, 270-pound Embiid. After initially looking overmatched defensively, the center showed off his shooting stroke. He made 6-of-10 shots -- including going 4-for-8 on three-pointers -- en route to scoring 16 points. Simmons saw a lot of action at center and power forward to make up for Embiid’s absence. The 2017-18 rookie of the year made 10 of 13 shots and finished with 23 points to go with 15 assists and 10 rebounds for his seventh triple-double of the season. Butler scored 12 of his game-high 30 points in the fourth quarter. JJ Redick added 20 points after missing the previous two games with lower-back tightness. Kevin Huerter paced the Hawks with 29 points, while Collins added 25. Justin Anderson, top, of the Hawks dumps cups of water on Kevin Huerter after their victory over the Sixers on Jan. 11, 2019. Huerter scored 29 points. Hawks rookie point guard Trae Young had 18 points on 5-for-12 shooting. The Dallas Mavericks acquired him with the fifth-overall pick in June’s NBA draft. The Mavs immediately traded him an a protected 2019 first-round pick to the Hawks for Luka Doncic. Doncic is the front-runner to win rookie of the year and is second behind Los Angeles Lakers forward LeBron James in fan voting for Western Conference frontcourt players. Meanwhile, Young came into Friday’s game shooting just 28.8 percent on three-pointers. He struggled to find his groove against the Sixers. Young missed his first four shot attempts, including two three-pointers. His first basket came while being fouled on a layup with 6 minutes, 5 seconds left in the second quarter. The Texas native converted the three-point play to give the Hawks a 45-42 advantage. They were his only points in the first half. Things could have gotten testy in the with 2:19 left in the third quarter. Alex Len elbowed Butler in the face while attempting a shot underneath the basket. Butler went crashing to the floor. He was on the ground for a second or two. Then he suddenly tried to get up with an angry look on his face. That’s when teammate T.J. McConnell stepped in and even dragged Butler backwards to make sure he didn’t try to confront the reserve center.